In today’s world of burgeoning cybercrime, passwords and password security have become critical in the way we protect ourselves online. It’s not too difficult to create a different strong password for each account but it is not so easy remembering them all. This is where password managers come into their own and the main reason they have become an integral part of our online security kit. SpeedyPassword is a relatively new browser-based password manager which first came to my attention via a series of favorable reviews. I followed up by reading through the blurb on SpeedyPassword’s official site and was suitably impressed. My interest now piqued, I decided it was time to check out this new password manager more thoroughly. SpeedyPassword is available as a free add-on for Internet Explorer (10+), Firefox, and Chrome. I decided to try out the Internet Explorer version. Now, this next part was supposed to be a review, but alas, after installing the add-on, creating a heap of screenshots along the way, in the end it just broke Internet Explorer. After installing the SpeedyPassword add-on I could no longer connect to my home page, and links to managed pages on Facebook were no longer working (active). In order to establish conclusively that SpeedyPassword was the culprit, I disabled the add-on and sure enough, everything returned to normal. These were just two issues which immediately came to light, I have no idea what else may have been broken by the add-on as I decided to leave it disabled pending further research. I sent an email off to SpeedyPassword support, including a description of the issues with screenshots. I received a response within 24 hours to the effect that they had managed to replicate the issues and would be releasing an update as soon as possible. They also assured me that I would be informed as soon as the updated version was available. Our QA team has been able to replicate the issue you discovered and our lead developer will be working on an update to fix this. We truly appreciate the thorough and complete information you have provided, I’m sure you know this makes it much easier for us to locate the problem. When we have a fix available, we can contact you to let you know. That was over 3 weeks ago and, despite sending several follow up emails asking if the new version was available, I’ve received nothing further from the support team. Seems they have now chosen to ignore my emails. Then, a strange thing happened. 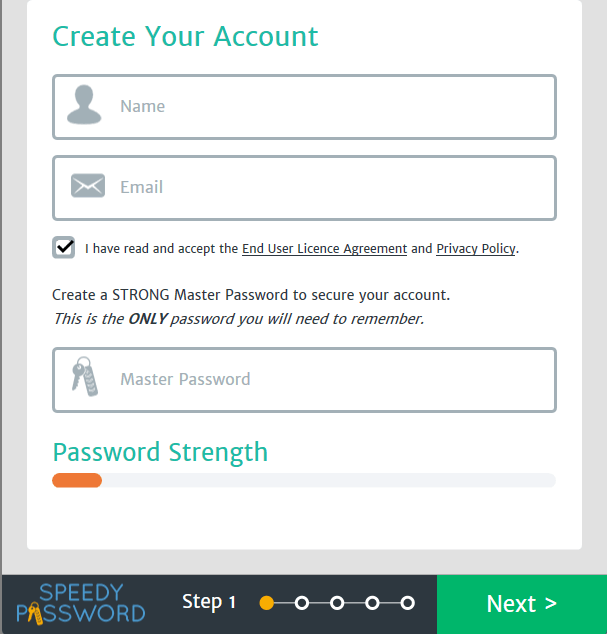 SpeedyPassword’s installation requires setting up an account which involves submitting a user name and email address. 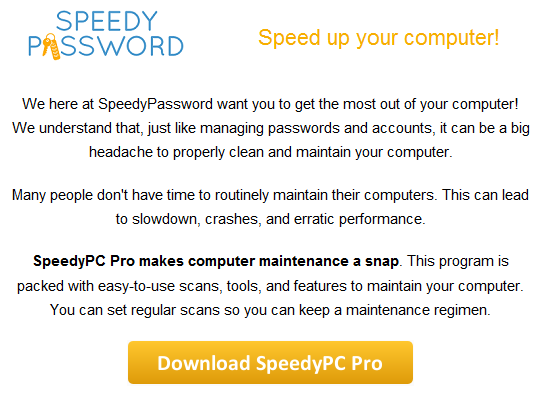 Two weeks later I received an email from SpeedyPassword extolling the virtues of a software called “SpeedyPC Pro”. The name of the software immediately rang a bell, I could recall SpeedyPC Pro being embroiled in some sort of controversy at some time or other. So, off to Google for further investigation. Despite the obvious similarity in names, I also checked to make doubly sure both products originate from the same source. Sure enough, both SpeedyPassword and SpeedyPC Pro are distributed by the same company (ParetoLogic) and share the exact same address in Canada. My suspicions confirmed, I continued to browse through search results, coming across numerous reports of the unsavory nature of SpeedyPC Pro. I could not locate any information regarding the outcome of that law suit. Finally; in the following screenshot taken from the SpeedyPC Pro site, note the claim of being an approved Microsoft Partner. According to every report I could locate, this is a false claim and Microsoft is not affiliated with the software in any way. Apart from the issues I experienced myself, the SpeedyPassword software appears to be above average, including features which are generally reserved for commercial password managers. The SpeedyPassword site is so new it hasn’t yet been rated by any of the leading site advisory services so it’s difficult to get a handle on specific security implications. However, considering SpeedyPC Pro’s less than stellar reputation, and seeing how it’s the same company involved, it certainly raises some serious questions. So, even working on the premise that SpeedyPassword itself is a safe and useful software, I guess the bottom line is… knowing that it comes from the same company as SpeedyPC Pro, would you be prepared to trust SpeedyPassword with your passwords, email address, and other personal information? Prev:Windows 8.1 – How Much Space Are Those Apps Using? No I wouldn’t, full stop. Thanks for this alert Jim. I got this program off download.com when it first came out and noticed similar things. Got a similar response that they are working on it. Also got the same email about that other program which I didn’t download. I really like this program and think you hit it on the head that this is totally free where as others you have to pay or do things to get the same functionality. So even if they make other programs that people might not like I really like this one and have kept it. Hopefully they fix the bugs but as far as a password manager goes I would say yeah its safe. Appreciate your input here Jeff, thanks. BTW: You really ought to stop using download.com, they don’t appear to give much consideration to user safety at all. Major Geeks would be a much better and safer alternative. Two words – ‘Paretologic Inc.’!!! More than two words: The president (co-founder and ex-CEO), Elton Pereira, also co-founded ‘RevenueWire Inc.’ in 2007. ‘SafeCart’ (a subsidiary of RevenueWire) handles the reselling of Paretologic products). ‘Nuff said! As far the program goes though, did you find any issues about the security of the program that raised any flags? I am just interested as I am still using it and honestly haven’t found anything that would raise flags but hoping a pro with you could pass on some tips. did you find any issues about the security of the program that raised any flags? No, nothing specific Jeff. The downloaded executable scans 100% clean through Virus Total and, as I pointed out in the article, there are no ratings as yet from either WOT or MSA, and very few user reviews. I am not actually judging the software itself and wouldn’t be at all surprised if it turns out Speedy Password is perfectly safe. However, one simply cannot ignore the company’s less than stellar reputation. BTW: I wouldn’t be surprised if Speedy Password’s distribution model was changed to ‘Fremium’ at some time down the track, offering both feature-limited free edition and full-featured Premium edition… we’ll see. Hmmm…should I be concerned that I use Paretologic ‘Regcure Pro’ based on the comment made by sirpaul2 . I use Random Password generator and Strong Password generator. Hopefully they will suffice? Just wanted to circle back and say that I still haven’t found any issues at all. And there is still not any freemium offers that are making me pay so but it could always be changing? I would just keep checking back at http://www.speedypassword.com to see if there are changes but I am still loving this program! If you are using it and not finding issues, or feeling issues and are enjoying it then why not keep using it? From my interactions with Speedy Password I have noticed that it is not just a password generator but a manager that can generate strong passwords and keep them in a safer spot than in your browser. I am not familiar with Strong Password generator but the site http://strongpasswordgenerator.com/ seems to just make hared to break passwords, versus managing them in a safe and secure way.. I am wondering, since it’s now being a year since your review, have you had the chance to take another look at this product? Hi Robert – No, since this review I haven’t looked at SpeedyPassword again. Knowing that is is associated with Paretologic was enough for me, especially seeing how it involves passwords. Personally, I wouldn’t touch it with a barge pole. Just received notice regarding download. Found you through Google. Glad that I did. Thank you for your stance and dedication. I was interested in your comments re Speedypassword, bur, as always, was frustrated by the lack of an easily seen date on the article to see how current it is. This is a very common problem on may sites that provide information.and makes the article almost useless. Dates should be given right at the top of the article and easily seen. Yep, can’t get any nearer “right at the top of the article” than that. guessing it has more to do with the color and that the date blends right into the orange. Hi. I recently purchased a 2yr subscription to Paretologic on my laptop. (May 2015) I was then asked if I wanted Speedy Password for free, so clicked Yes and downloaded it, then set up the master password etc…. I am now really concerned after reading your comments in the forum. Should I uninstall Speedy Password and/or Paretologic do you think? I have used the scan program several times but when I told Speedy Password that I did not want it changing my home page, the screen icon disappeared and hence I have not ever used it. I saw the Microsoft message and thought it would be safe but should really have sought more info first. I just come across the Speedy Password and looking for a review over the web. Thank you for your detail review on it. I will definitely get rid of it.